In response to President Barack Obama’s executive order on immigration Thursday, Republican lawmakers have threatened to sue the president or block his judicial nominees on grounds that the president overstepped his constitutional powers. Obama’s unilateral action, which will grant deportation relief to roughly 5 million undocumented immigrants, came almost a year and a half after the Senate approved a comprehensive immigration reform measure. House Republicans have refused to take up that bill but also failed to move an immigration plan of their own, saying they will pursue a more piecemeal approach to the issue. While the constitutionality of the president's order has been cleared by both liberal and conservative legal experts, GOP lawmakers, including House Speaker John Boehner (R-Ohio) and Texas Gov. Rick Perry (R), are still calling the action illegal. Following Obama’s announcement, Boehner accused him of acting like a "king or emperor," adding that Republicans "will not stand idle as the president undermines the rule of law in our country and places lives at risk." During a Fox News interview Sunday, Sen. Ted Cruz (R-Texas) argued that only Congress is authorized to legislate federal immigration policies and said Obama was "defying the law, defying the constitution" and "behaving in an unprecedented way." Congress' exclusive immigration powers include ending all deportations and permanently altering a specific group's immigration status. Obama's order does neither. While Obama’s new policy may be more expansive than previous presidential orders on immigration, the order itself is certainly not unprecedented. Since 1956, two presidents -- both Republican -- have employed executive orders to implement immigration reform. In 1981, Ronald Reagan moved to defer the deportation of roughly 100,000 undocumented immigrants. In 1990, George H.W. Bush also used his executive powers to relieve 1.5 million undocumented immigrants of deportation. 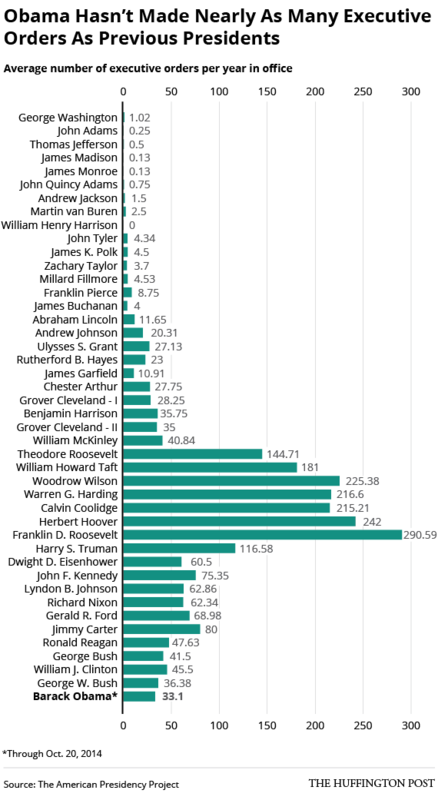 In fact, Obama has issued fewer executive orders than every president since 1901. While Democratic presidents have relied on executive orders more frequently than Republicans over the last 100 years, Obama’s average executive orders per year in office fall nearly 3.3 points below George W. Bush, 8.4 below George H.W. Bush and roughly 14.5 points below Ronald Reagan. A new survey conducted by Hart Research Associates has found that a majority of Americans are supportive of Obama’s executive action on immigration. According to Friday’s poll, conducted on behalf of liberal group Americans United for Change, 67 percent of likely 2016 voters said they supported the president’s plan while 28 percent opposed it. CORRECTION: A previous version of this article stated that George H.W. Bush acted unilaterally on immigration in 1986, when in fact it was 1990.